The Vatican Museums welcome everyday the impressive number of 30 000 visitors, so the site is often very crowded especially in the high season (from April to October). if you really hate crowds, this tour is perfect! 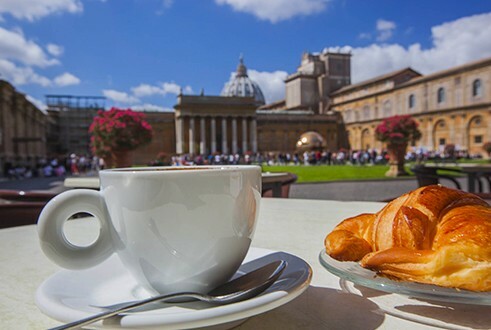 The Vatican will treat us with a nice breakfast in one of courtyards, then at 8 am ( 1 hour before the general opening!) we'll be admitted in the collections. We can visit the Pius Clementimum, the Gallery of Maps and Sistine Chapel before the arrival of big groups. At the end, we can visit the St. Peter Basilica or wander in the other collections, as you prefer. - We'll enter at 7.15 am for the breakfast. - we'll be not admitted in the collection before 8 am (anyway 1 hour before crowds) - the Basilica of St. Peter is a working church, so can close without notice for religious events or security reasons. I'm NOT responsible for this issue, but I'll do my best to provide the tour as described. Admission tickets are not included. Tickets must be booked at least a month before your tour (very requested). I can take care of the reservation of the skip-the-line tickets + the early pass (68€ a head).